Welcome to the NEWLY renovated and 2015 Renovation of the Year award winning Holiday Inn Orlando East-UCF Area Hotel conveniently located just over a mile from the University of Central Florida and the CFE Arena. And, only minutes from Central Florida Research Park and Quadrangle Office Park home to several major local corporations such as AFAMS, General Dynamics, Lockheed Martin, NAVAIR, Northrop Grumman, PEO STRI, Raytheon, Rockwell Corporation, SAIC, Siemens and Central Florida Research Parkway, the Holiday Inn Orlando East-UCF Area Hotel is your best choice in East Orlando. 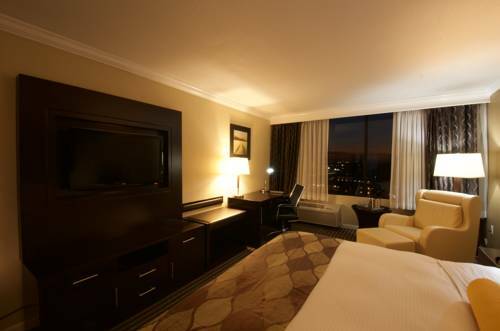 The Holiday Inn Orlando East-UCF Area Hotel is the ideal destination. Imagine having all the space and tools you need for business, complimentary Wi-Fi and a specialized work area in your room. We even have the right space for your professional meeting with over 4,500 sq. ft. of meeting space. And, if youre here for pleasure you are just minutes away from the Waterford Lakes Town Center Mall where you can experience first-class shopping and entertainment. The Holiday Inn Orlando East-UCF Area Hotel is your personal retreat. Guests enjoy amenities including our outdoor pool, Fitness Center, 24-hour Business Center, and when its time to dine you can enjoy first-class room service or a dining adventure at the Black & Gold Bar & Grill. Alafaya Garden Bar & Bistro: The Black and Gold Bar and Grill serves up specialty cocktails and a variety of beer and wine options. Join us for happy hour or try one of our daily specials. Grand Ballroom: Our Grand Ballroom is a beautiful, modern banquet space perfect for a variety of events, including conventions, meetings, conferences, wedding receptions, and social events. Diamond Ballroom: Our Regency Ballroom is the perfect space for a variety of events, including conventions, meetings, conferences, wedding receptions, and social events. The ballroom can be used as one large ballroom or can be divided into Salon A & Salon B spaces. Garnet Ballroom: The Magnolia is a perfect meeting space for mid-sized meetings, conferences, training seminars, and small banquets. Executive Board Room: Our Executive Board Room is a perfect location for your management trainings and meetings. Seating 12, the Board Room features dark wooden furniture and luxurious leather seating, a flat screen television, and laptop connection capabilities. Waterford Lakes Town Center MallWaterford Lakes Town Center Mall boasts a variety of department stores and specialty shops. If you need to take a break from your shopping excursion it also provides dining and entertainment options. Twin RiversTwin Rivers Golf Course of Oviedo offers a scenic 18- hole championship golf course, located between the Big and Little Econ Rivers.